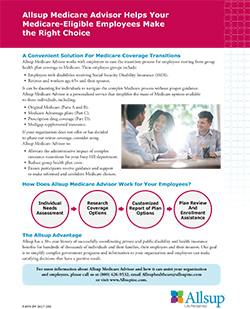 Allsup Medicare Advisor, offered by Allsup Inc., provides a comprehensive and convenient solution to coordinating your employees’ Medicare coverage. We are not a Medicare plan provider. Allsup Medicare Advisor is a Medicare plan selection service that incorporates a detailed, comparative analysis of plans, a tailor-made report and serves as a trusted resource for employers, financial advisors and seniors. It combines live, one-on-one guidance with the convenience of the Internet. Allsup will consult with you to thoroughly understand your organization’s needs and those of your employees regarding their transition to Medicare coverage. By highlighting the three plans in your area most likely to meet your stated needs, Allsup has the foundation to help employees compare coverage and cost across various Medicare plan options. Call us at (800) 426-9532, click here to e-mail us or complete the short form below for additional information about Allsup Medicare Advisor and how it can benefit your business and your employees. I'm looking for my business.